Painting is an educational form where children can easily assimilate information. Along with different teaching skills, they will be able to develop emotional, creative and a strong personality. Painting therapy is a source of communication through color, a method for assessing children’s creativity at each stage of their age. Also, for those who have stressed day time, it can reveal their inspiration mode, detachment stage, creative mind, and more skills in painting and drawing techniques. 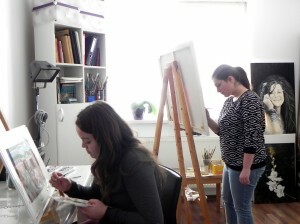 Drawing and painting courses are taught by artist Anca Jitariu Gliga. *the session is confirmed at least one day before. Painting exhibitions for our students every year.